Scorpio November 2019 horoscope predicts that family interests and emotional wellbeing will be your focus this month. The Scorpio personality can get things done with power and enterprise. People admire you because of your determination and optimism. Scorpio zodiac sign is aggressive and independent. You are the person who pushes people to do their best and strive to achieve greatness. This not only applies to other people. But to you as well since career development and financial prosperity is not a new thing to you. The Scorpio 2019 predictions reveal that cooperation with other people is important to you since you get to learn new things and gain new and helpful skills. As per the November horoscope 2019, singles will get romantic partners in workplaces or business meetings. The Scorpio compatibility shows that your partner or spouse will be involved in your financial career in one way or the other. The support you give each other will motivate you to want to have Scorpio children sooner. The partnership and love you share with your partner will make you happy and fulfilled. 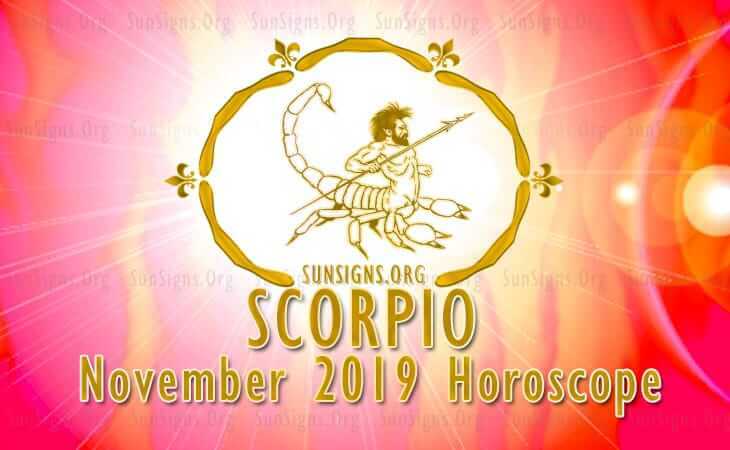 Scorpio November 2019 predictions foretell that your children will be happy this month since you and your spouse are on good terms. They will be disciplined and well behaved throughout the month. They will respect the elders in the society since they are obligated to do so. According to the horoscope 2019, the stars will bless your health abundantly this month. You will not experience any health-related issues only if you take good care of yourself. Ensure that you exercise daily and take balanced diets. This schedule will help you go along without complaining about a mere headache. The horoscope 2019 for Scorpio predicts that your focus on family matters will not deter you from achieving success in your career. Your job will progress well because of your determination and reliance on other people who are beneficial to your cause. 2019 monthly astrology predicts that this month your finances will increase immensely. You will gain money from all the investments that you have made since the year began. Your social contacts will also help you in achieving great financial prosperity. Scorpio November horoscope 2019 predictions show that education for you this month will be a little bit tricky since your mind is not in the right place. Most of your focus has been directed to family matters and emotional stability. You will have to achieve those above before embarking on any educational pursuits. As per the Scorpio November 2019 horoscope, traveling with your family will be your main thing this month. You want to bond with your children and spouse. Hence, you will see new places and make new memories together that will last a long while. You may be interested in Numerology Horoscope 2019.